A rare artefact/survivor; an Italian Arts & Crafts Casa Guidi small tooled leather silk lined box/case with Celtic style design; c1910. 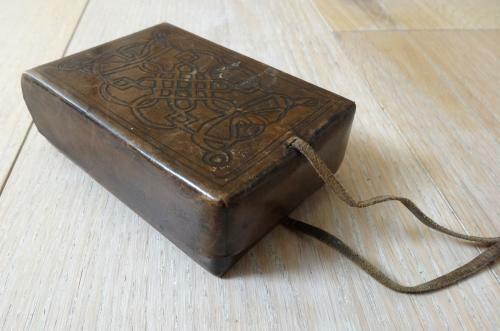 Possibly originally designed as sewing or trinket box, or perhaps for playing cards or suchlike. The Casa Guidi Arts & Crafts business was based at, 9 Piazza S. Felice, next door to the apartment of Robert and Elizabeth Barrett Browning, called Casa Guidi by the poets, which was number 8. Both would have been part of the larger Palazzo Guidi. In 1893 their son, Robert Barrett (Pen) Browning purchased the entire Palazzo Guidi; it was still in his possession at the time of his death in July 1912. It is certainly feasible that Robert Barrett (Pen) Browning might have had some connection to the Casa Guidi Arts & Crafts business, either as a landlord, or as someone interested in selling the Asolo-produced lace and linens; he did run a business that produced hand-made lace and hand-woven linen in the small Italian town of Asolo. The Palazzo Guidi was sold in 1913 to an American, Signora Centaro (née Ellen Laura Hutchinson) and remained in her family, apparently through the second world war. Source: Hope, Emily Blanchard. “Saving Casa Guidi,” Browning Institute Studies, vol. 1 (1973), pp. 1-10. There was an organization called The Browning Foundation, in Florence, established in 1916 with the purpose of establishing a memorial to the Brownings in Casa Guidi and it may possibly be that The Casa Guidi Arts & Crafts venture also helped fund that. Approx 4.%" by 3" by 1.5"
My thanks to Cynthia A. Burgess, Librarian/Curator of Books & Printed Materials at Armstrong Browning Library, Baylor University in Texas for her assistance with the above. The Armstrong Browning Library holds a volume by Matthew Arnold (Poems, Narrative, Elegiac, & Lyric, London: J. M. Dent, 1905) that has “Bound at the Casa Guidi Arts and Crafts, Florence” on the cover.